Bridgette A. Kolb joined Katz Friedman in 2014. Her practice is focused on protecting the rights of workers in Workers’ Compensation, Labor, and Employment law. Bridgette represents clients in Workers’ Compensation and Occupational Disease cases. She is a zealous advocate who is dedicated to obtaining the compensation that injured workers and their families deserve. Bridgette has successfully represented clients with a wide variety of injuries, including injuries to the back, neck, and shoulders as well as burns, infections, and significant injuries to eyes. She has represented injured workers’ in claims against United Continental Holdings, American Airlines, Ford Motor Company, PepsiCo, DHL, Hyatt, and other employers throughout Illinois. Bridgette represents the Firm’s labor union clients as well as individual employees in employment matters. She represents workers who have been the victim of unlawful employment practices by their employers. She has represented employees under the Family and Medical Leave Act (“FMLA”), Age Discrimination in Employment Act (“ADEA”), the Fair Labor Standards Act (“FLSA”), the Illinois Wage Payment and Collections Act, and in discrimination claims based on Gender, Race, Pregnancy, and Sexual Orientation as well as sexual harassment claims under Title VII and the Illinois Human Rights Act. Bridgette practices in State and Federal courts throughout the state of Illinois, as well as before National Labor Relations Board, the Illinois Public Labor Relations Board, Illinois Educational Labor Relations Board, and the Illinois Workers’ Compensation Commission. Bridgette has also handled labor arbitrations on behalf of the firm’s union clients. Bridgette has written and assisted with numerous briefs at the Arbitration, Commission, Circuit Court, and Appellate Court levels. Bridgette has also successfully argued appeals before the Illinois Workers’ Compensation Commission and Circuit Court. Bridgette aided with the appeal in Steven Dunteman v. Illinois Workers’ Compensation Commission. In that case, Caterpillar refused to pay benefits to an injured employee, arguing that the employee was not entitled to benefits because his own self-treatment had worsened his condition. The Illinois Appellate Court found in favor of the employee, establishing that Illinois workers are entitled to workers’ compensation benefits even if self-treatment causes the injury to worsen in severity as long as the injury is work related. Bridgette has assisted in research and drafting various Workers’ Compensation, Labor, and Employment law articles and publications. She has aided in the drafting of IICLE Continuing Legal Education topics covering a variety of current Illinois Workers’ Compensation topics, including assessing Permanent Partial Disability, settlement contracts guidance and pitfalls, and the impact of social media in workers’ compensation claims. Prior to becoming an associate at Katz Friedman, Bridgette worked as a clerk for Katz Friedman while in law school. 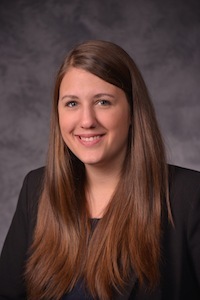 While in law school, Bridgette had the opportunity to assist in the research and drafting of a presentation on settlement contracts in front of the Illinois Workers’ Compensation Arbitrators. Bridgette received her Juris Doctor degree from Chicago-Kent College of Law with a certificate in Labor Employment Law. While in law school, she was an active member of the Labor Employment Law Society. She had the opportunity to participate in the Peggy Browning National Workers’ Rights Conference as a student leader in 2014. While in law school, Bridgette was also an active member in the Society of Women in Law. Before attending law school, she graduated from the University of Illinois at Champaign-Urbana as a James Scholar, earning a Bachelor of Science degree in Psychology and a Bachelor of Arts in Communication. Bridgette is a member of the Illinois Bar and is admitted to practice before the Supreme Court of Illinois and the United States District Courts for the Northern and Central Districts of Illinois. She is an active member of the Workers’ Compensation Law Association, Chicago Bar Association, and National Employment Lawyers Association. Bridgette is originally from the Detroit suburbs. In her free time, Bridgette volunteers at events for children and adults with disabilities in the community and tutors local elementary students. She enjoys cooking, exploring Chicago, and spending time with family and friends.